Situated on the Allée de Tourney, the hotel boasts a very central location and is close to the city’s main shopping street, la Rue Saint Catherine. The hotel’s relaxing spa centre with a high-tech Jacuzzi is open daily from 8am to 10pm and for the ultimate pampering experience, a wide range of treatments are available. For gourmet dining, the hotel’s Chef Jean Christophe Martinez serves mouth-watering creative cuisine in Le Comptoir de Sèze restaurant. Inspired by the flamboyance of the 18th Century, the 55 rooms follow various unique themes and combine leather and suede furnishings with antique-style paintings and wallpaper. Perfectly located at the heart of the village of Sauternes, this enchanting 18th Century guest house has been designed in a warm and intimate style. 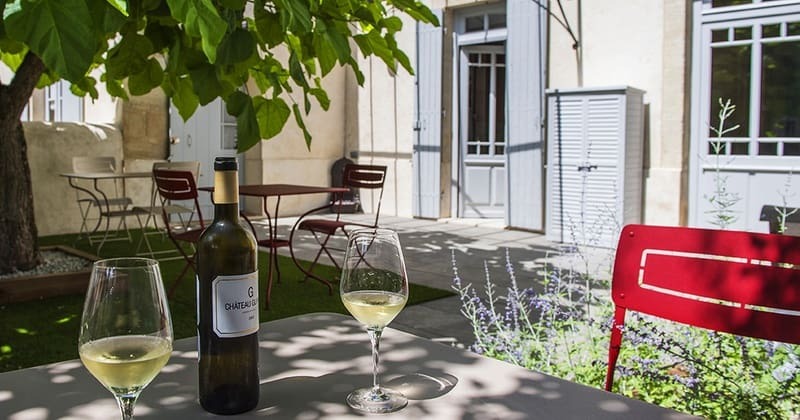 La Sauternaise is located 40 km south of Bordeaux, in the famous village of Sauternes. Restaurants and wineries can be found within walking distance of the hotel. A delicious breakfast with fresh, local products is served every morning in the dining room, or in the garden if the weather permits. In the dining room, you will always find a coffee machine and a kettle at your disposal. A lounge area is also available in the house, with a TV and a great range of books about the region and the local food and wines. Free parking is possible in the nearby quiet streets of the village. The four unique rooms are a true haven of relaxation. The bathrooms offer hammam, sauna, jacuzzi bath or hydro-massage shower.